I've got just over 140hrs now, mainly flying my boss's C150 Aerobat. Looking for some good challenging fields to fly into. As you can probably tell, for me, the more out there the better. Microlight fields, gliding sites, the smaller the better! I also live in Newcastle so anyway not 200 miles away would be appreciated but I get most will be from the south. UK - Nayland, every day and twice on Sunday! Another vote for Nayland - I based my shared Jodel there for many years. Get a proper briefing first - one way for landing and the other way to take off. Runway on a genuinely steep hillside with steeper hills directly bordering the runway margins. I had never heard of Nayland, so I looked it up, expecting it to be in suitably rugged part of Britain. I was very surprised to discover it was in Suffolk, just across the border from Essex! I looked at it on streetmap.co.uk - the contours and the appropriately named Hill Farm give the game away. During my search, I saw a reference to a 2004 PPRuNe thread about a legal challenge to the airfield. Interesting reading but no follow-up. What happened in the end? What was the legal process that prevented the presentation of evidence? Spilstead Farm near Battle in Sussex. Undulating to put it mildly. But well worth a visit to meet Bill Cole. Nayland, land, pointing at what looks like a vertical cliff - then FULL throttle to get up the hill. There is a tractor for those who dont. Take off, like going off an aircraft carrier - no visible runway after a couple of hundred feet. Very scary, much more than St. Barts which I did the training on earlier this year. Lots of taildragger types at Nayland, Champs Austers and such. Easy to find - has Nayland in big letters painted on the hillside. I recall a nasty accident there a decade ago when a couple of women in a PA28 out of Southend thought they would give it a go. I am not sure if it is still open, but when I last went there in a MS-880B around 1990, it was built on an old railway line, with cinder and an embankment that fell away either side. A few years later I know someone who managed to deviate on landing down the embankment, writing off the aircraft. I have to add, that not enough PPLs experience flying into airstrips, but it requires more preparation, research and revision on the performance data. Sadly I suspect quite a few clubs in this country discourage strip flying. John Lloyds old strip. 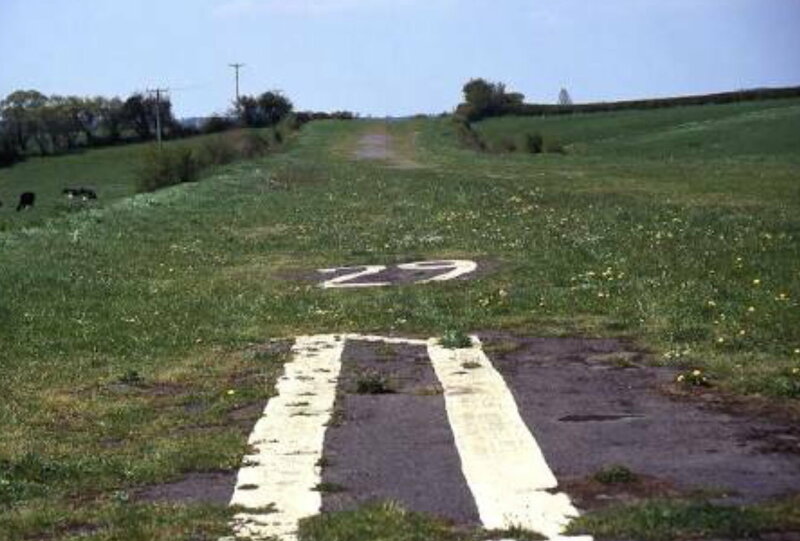 Interesting approach to say the least and a runway made from old tarmac scalpings. Long closed so ignore that one. EGNF's a bit challenging (short) for those who can't land on the numbers (or find it in the first place)! St Mary's to a lesser extent. Northrepps International circa 2000 - it moves from time to time, but the yr 2000 incarnation was short and sloping. The long-gone Canterbury strip ate a few aeroplanes. Any field without “strip” in the name e.g. stubble field, harvested pea field, newly sown barley field, cattle or sheep grazing field. Or “beach” if you want to lower the odds of bending your machine. As far as semi recognised landing sites, a mate has a ski jump type strip set up on the face of the Glens at the back of Auchenblae with power pylons just below the leap off point. Always a bum clencher on departure. Closer to home for you. Hexham. There's also Peterlee, Causey Park, Currock Hill, the other Peterlee etc. In fact you're pretty much surrounded by strips. Many not on the charts. Perhaps you're just not talking to the right people.